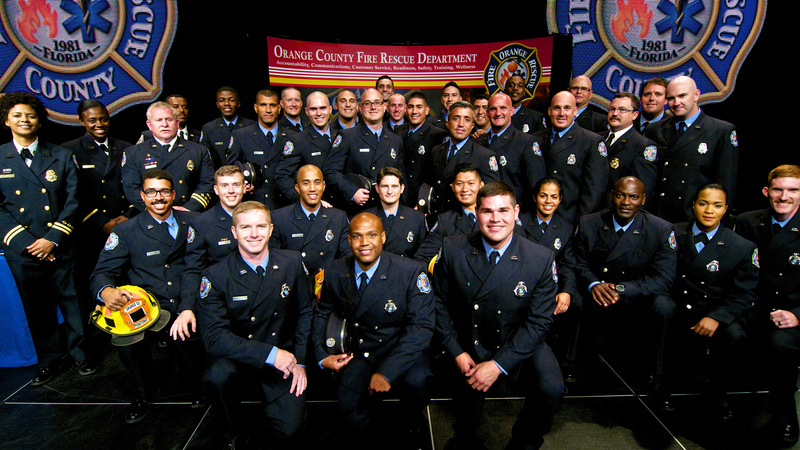 Orange County Fire Rescue celebrated the graduation of Recruit Class 76 and recognized 15 employee promotions at a ceremony held at Full Sail Live in Winter Park on Nov. 3. Orange County District 6 Commissioner Victoria P. Siplin attended the ceremony and Deputy County Administrator Dr. George Ralls provided opening remarks. Family and friends filled the venue as the department officially welcomed 35 new members of Recruit Class 76 to begin their service to the Orange County community. The recruits completed a grueling eight-week orientation leading up to the graduation filled with live burn training, physical conditioning and classroom instruction. Class leader and Firefighter/EMT Belinda Rennes, addressed the class and thanked the families, instructors and Fire Chief Otto Drozd III for their support during the intensive process. The department’s newest civilian paramedic also graduated at the ceremony. Additionally, fire inspectors, dispatch supervisors, engineers and a battalion chief were promoted.